The website of a Spanish photographer stripped of his Wildlife Photographer of the Year title after judges suspected he used a tame 'model wolf', still claims he won the contest. The website of a Spanish photographer stripped of his Wildlife Photographer of the Year title after judges suspected he used a tame ‘model wolf’, still claims he won the contest. On Wednesday José Luis Rodriguez was disqualified from the competition and banned for life after judges ruled that the ‘Iberian Wolf’ featured in his winning entry was probably a trained wolf from a zoo near Madrid and not a wild animal. 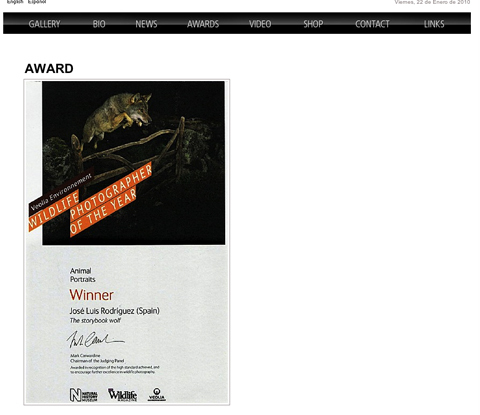 The photographer’s website today still boasts the image on its front page alongside a congratulatory quote from Mark Carwardine, chair of the judging panel, made before the controversy blew up. Competition organisers say that the photographer denies using a model animal. Amateur Photographer has tried to contact Rodriguez since we first broke news of his disqualification. However, Rodriguez’ son told us by email that the photographer was currently on assignment in Madeira where he has been photographing ‘marine birds’ in the Atlantic and was therefore not able to respond to our request for comment. Nor does it seem that the photographer has been in touch with the contest’s organisers recently.